A day at the beach! Yes, you’ve watched The Deadliest Catch and know that the real money is to be made in the cold arctic seas, but you’d rather keep your operation small if it means you get to stay in warmer climes. And there are plenty of crabs to catch here! At least there would be if the other crab catchers would give you a moment’s peace. The local restaurants are offering up great contracts, but only for the fastest catcher. So get fast with those binding ties–it’s time to gear up and get to catching. 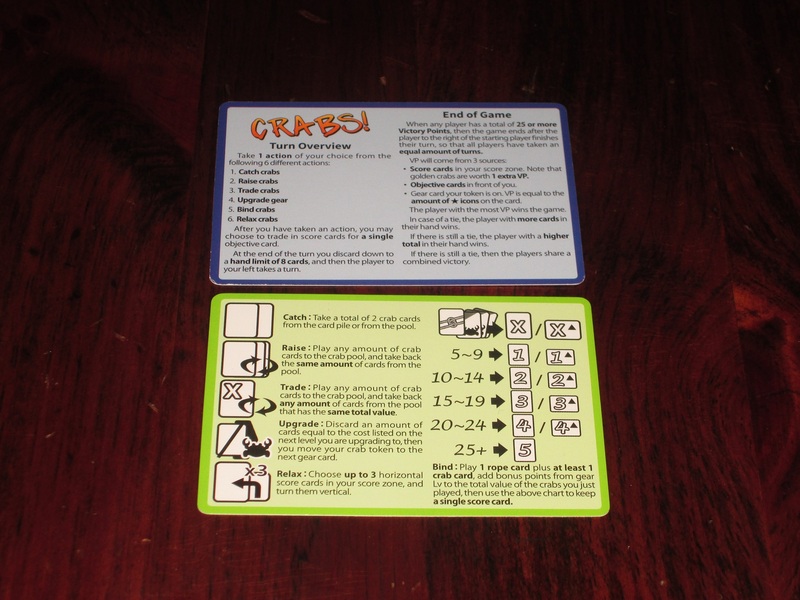 Crabs is a hand management card game for three to five players. Players are catching, raising, and binding crabs to fulfill contracts and get valuable crabs. The player with the most points after the points threshold is met wins. Crabs set up for three players. To begin, players lay out the gear cards in ascending order. 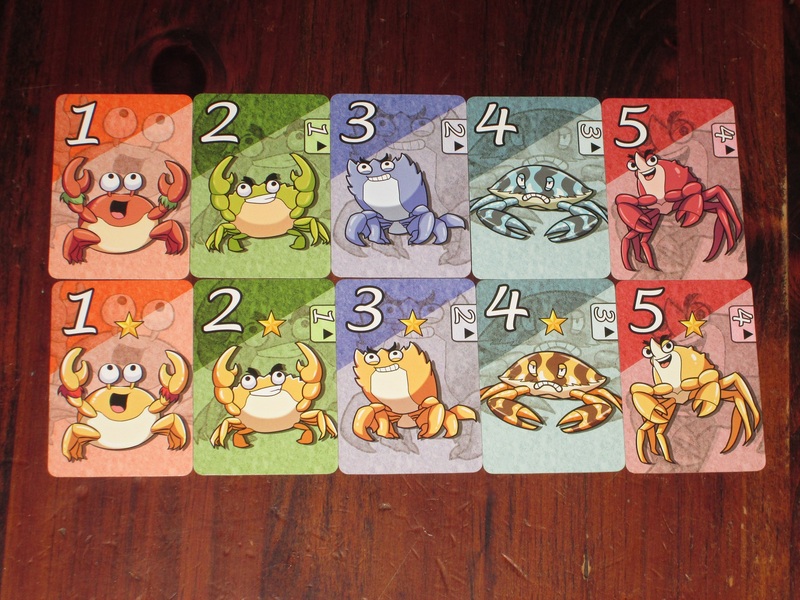 The crab deck is shuffled, and six cards are given to each player. Ten cards are turned over to form the starting pool. The contract deck is shuffled, and four cards are laid out face-up beside it. 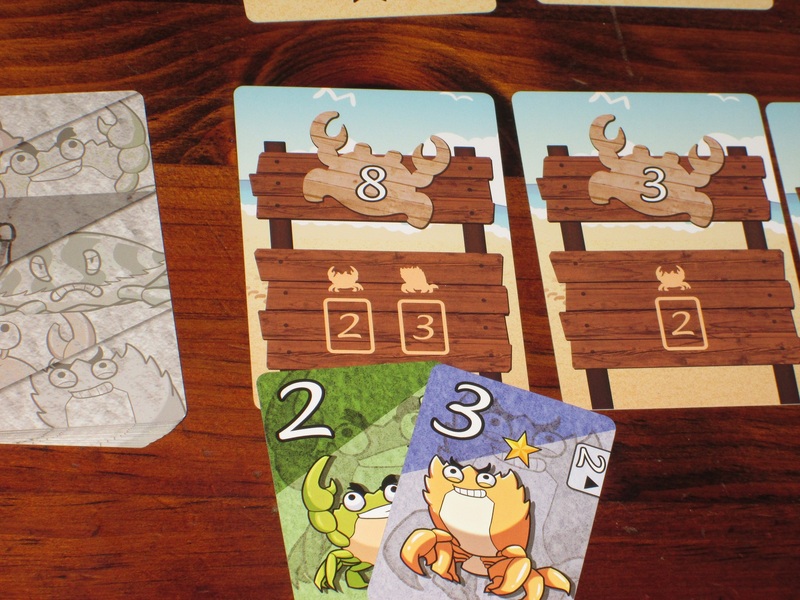 On each turn, players may take one action: take cards, score cards, upgrade their gear, or”relax” crabs. Players can take cards in three ways: they can draw two cards from the crab pool or the deck; they can discard a number of cards to the pool and draw the same number to their hand; or they can discard a number of cards and draw crab cards that equal the total of the cards discarded. The player aid, showing setup and possible actions. 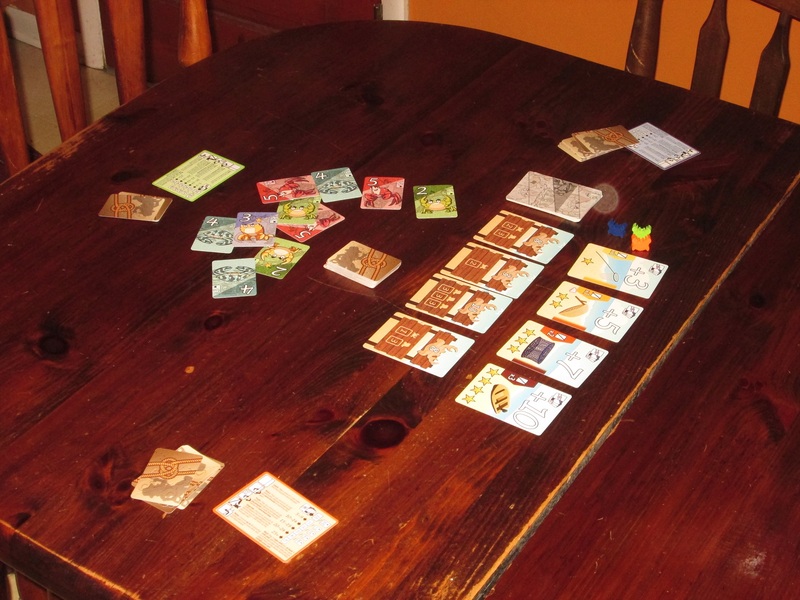 The table on the back of the player aid is necessary and is one of the rougher edges in the game. Another action players can take is to “bind” crabs to score them. They discard one card face down (the rope), then discard any number of cards from their hand, adding together the value of those crabs. They compare this value to the table on the player aid and keep one of the discarded cards, either horizontal (worth fewer points but easier to catch) or vertical, depending on the total. The remaining cards are placed in the pool. Players may also upgrade their gear, discarding cards and moving their crab token to the next gear card. Gear cards provide a permanent bonus when binding crabs. Players may “relax” up to three crab cards, turning them from horizontal to vertical. The gear cards and crab meeples, which are rarely spoken of without the word “adorable” nearby. After a player has taken the main action on their turn, they may trade matching vertical crab cards for one of the four contract cards on the table, returning those crabs to the pool and turning over a new contract card to take its place. The game ends when one player’s score is 25. The players finish the round so that each player gets the same number of turns. The player with the most points wins. 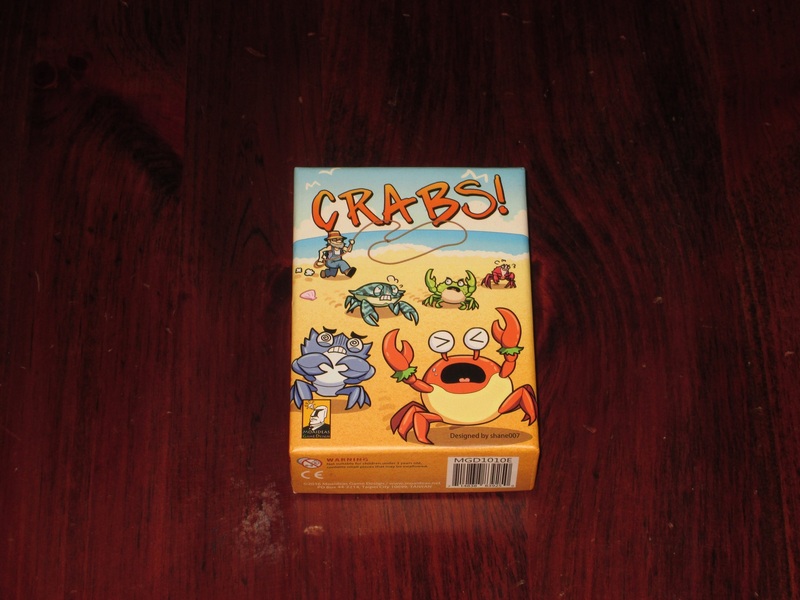 Crabs is another in a line of small-box card games that attempt to pack a lot of game into a little space. 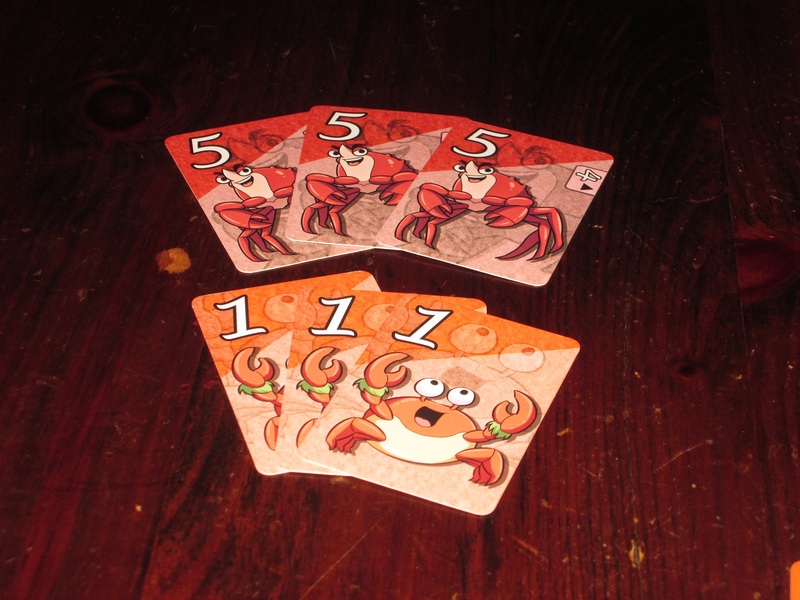 But while Crabs succeeds in being a decent card game with a little meat to it, I’m not eager to bring it out often. Binding a crab is sometimes difficult business. You need a rope, the right crab numbers, and, if you’re lucky, some good gear. Here I’ve got enough to catch a 5-crab outright. I think Crabs is most similar to a game like Century: Spice Road. Players are trying to manipulate their resources–in that game, spice cubes, in this game, crabs–through savvy trading to create the best opportunities to score. Now, don’t take this comparison too far: the games play very differently. But the idea of trading and manipulating resources–or as my wife calls it, wheeling and dealing–is one I enjoy. The different crabs in Crabs. Each crab has a regular and a gold version, the gold version being worth 1 extra point. 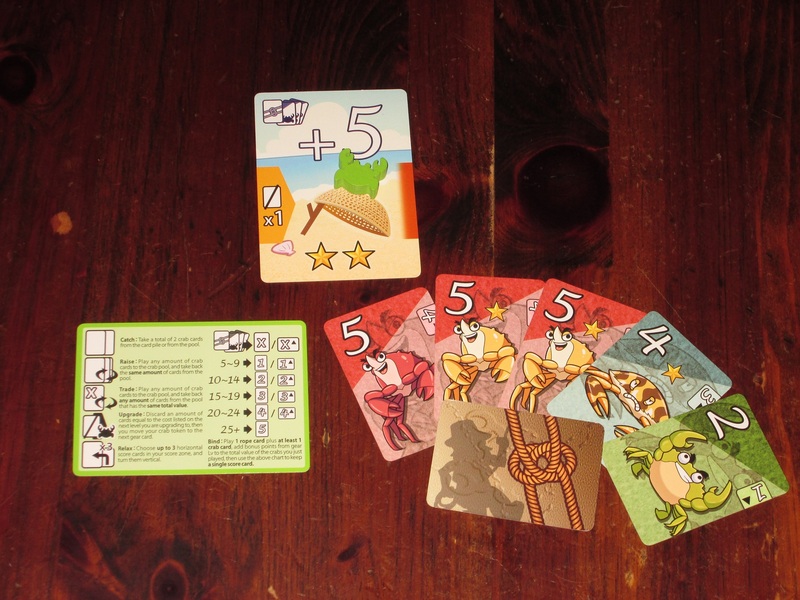 There are three separate actions for drawing cards in Crabs, and each of them allows players to subtly turn the game to their advantage. Maybe they just need cards–they can draw two. Maybe they want to upgrade the cards in their hands to better ones–they can discard cards and draw the same number of (hopefully) better cards from the pool or deck. Or if they need more cards, they can discard high-value cards to draw lots more that add up to the value discarded. 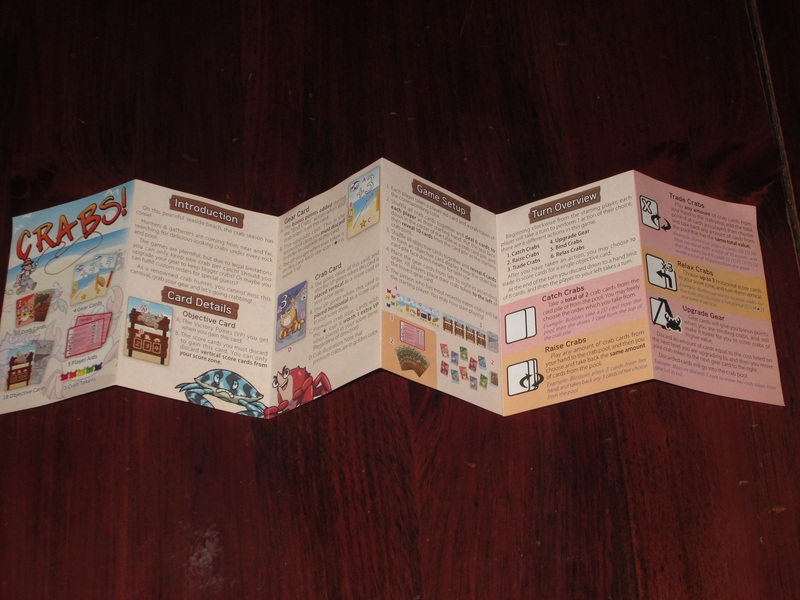 The card-drawing options put players in the driver’s seat of these trades. Three 1s for three 5s? Yes, please! The way cards score is also clever. It’s not enough to just get a few high-value cards and hit the same lever again and again. Even if your gear is fully upgraded, you always have to discard one card for the rope that doesn’t contribute to the value of the catch. So players have to either play the hand management game of getting cards and moving through them to make sure they have the right cards in their hands when they need them, or they have to score lower-value crabs, or they have to score higher-value crabs and waste a future turn relaxing them so they can be used. Juicy contracts are worth more than the individual crab cards. The tricky part is the game is a race. It’d be nice to fully upgrade your equipment before catching crabs, but the contracts are juicy enough (and worth more points than a simple crab catch) that you want to get those first. And while 25 points can seem like a long ways away when you’re catching 1- or 2-point crabs, it comes faster than you might think, so you have to watch the other players carefully and adjust your strategy accordingly. Upgrading your gear means fewer crab cards are needed to score crabs. Then again, if you’re spending your turns upgrading your gear, you’re not scoring crabs. Crabs is one of those games that is perfectly fine, and some people I think will get a kick out of it. 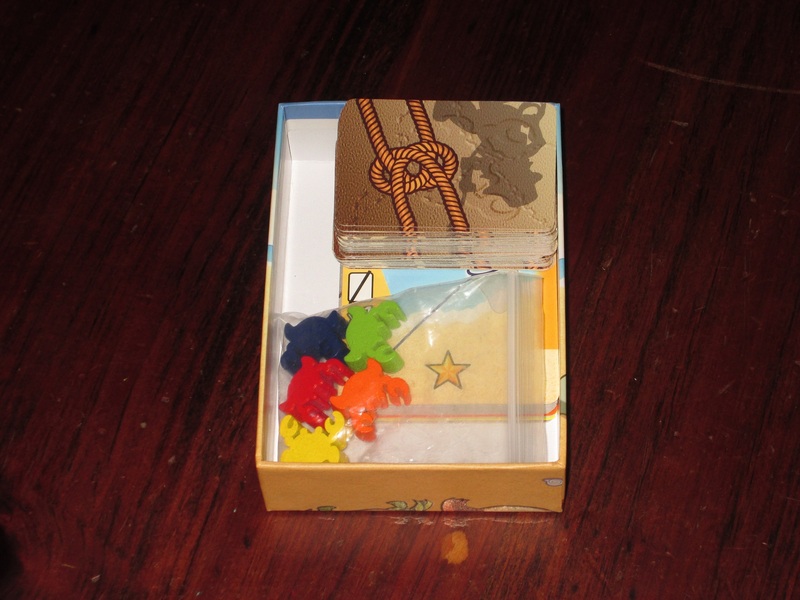 The box (at least for the Moaideas edition) is tiny, and there’s a decent game packed into a small space. For my taste, though, it’s one I don’t expect to play often. The rules sheet. For a game this quick, the rules are fairly long and text-heavy and more complex than you would expect. There are a few reasons for this. The first is expectations. The cartoony artwork and small size lend players to think of this as a cutesy filler to pass a few minutes, and that’s mostly true. The game does play quickly, and it’s one that players aren’t likely to take too seriously. That being said, there are enough rough edges in the game–enough rules complications–that make this a hard fit for those filler situations. It’s not complex (or interesting) enough to be a “super” filler like Race for the Galaxy or Glory to Rome, or even Jump Drive, yet it’s not simple enough to be an easy recommendation for the filler game space. The rules aren’t that complicated, but when faced with the choice of introducing For Sale or Coloretto or Crabs, I would always reach for the former two, both for the distilled experience and the simple explanation. I think you get more for less in For Sale and Coloretto than you do in Crabs. Crabs does pack a lot into a tiny box, and it still has room leftover for air. Of course, in Crabs’ favor is its flavor. 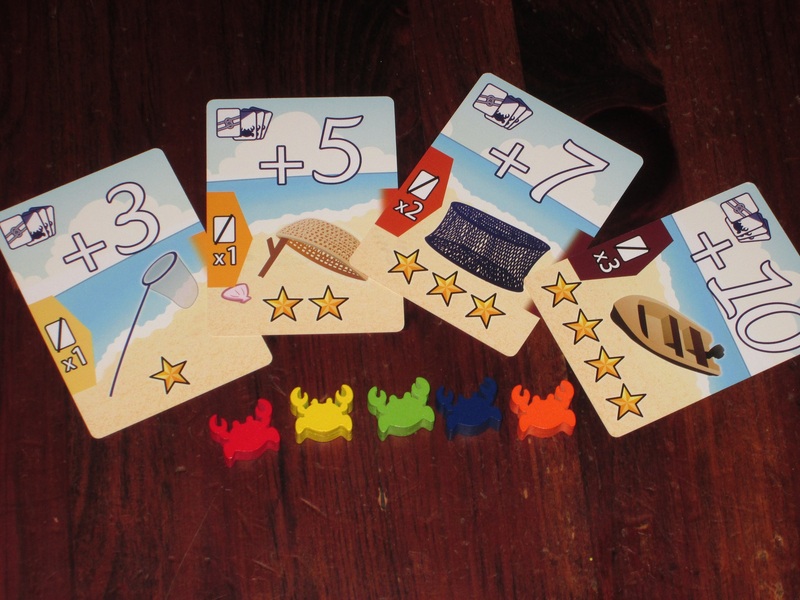 The cute crab artwork and adorable crab meeples might be enough to sway you toward Crabs. The components are serviceable and the game is a decent one, so if that’s the case for you, I don’t think you’ll be disappointed. For me, I’m a little torn on the subject of Crabs. On the one hand, it’s not a bad game. There are some decent decisions and a sometimes-smart hand management puzzle. On the other hand, the rules are more difficult than you’ll find in the best filler games, and the puzzle doesn’t seem worth the extra effort. I prefer my filler games lean and pointed, and the extra rules overhead in Crabs means it’s a game I’m likely to catch and release. 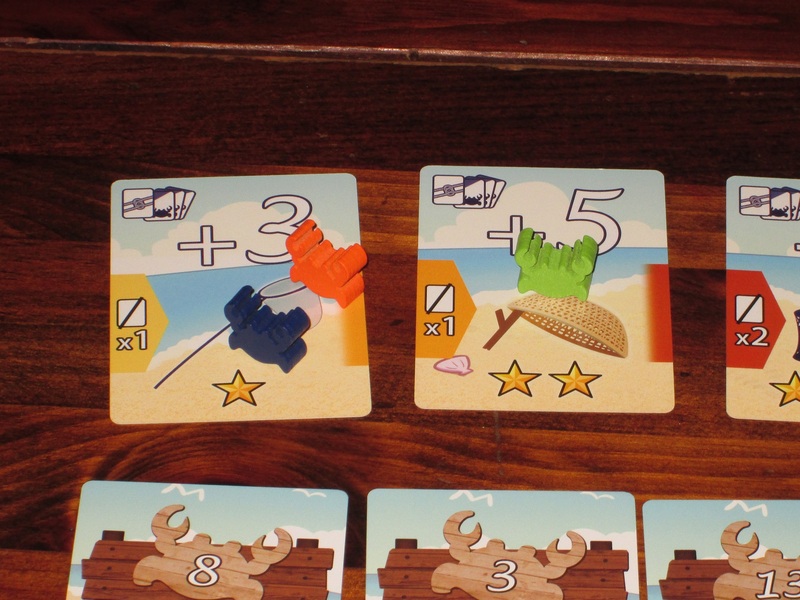 iSlaytheDragon would like to thank Moaideas for providing us with a copy of Crabs for review.